One woman’s story: a child lost at birth, war, betrayal, travel, dreams, and art. In a hospital in a foreign land, a young American woman gives birth. Her son, one hope of saving her troubled marriage to a mysterious man, is born dead. Soon after, while she still grieves, Susan's island paradise in Cyprus collapses into a war zone, and she finds herself trapped in fierce fighting between defending Greek and Turkish forces. Evacuated by the British Navy, she starts putting pieces back together in England. Then she learns that her husband had something to do with the war. And in lucid dreams, she sees that he is also cheating on her. She confronts him, and he responds with a too-professional chokehold that threatens her life. Stunned, she finds herself penniless in the streets of Brussels. But friends, dreams, and creativity push her forward as she discovers that her "ticking clock" is not the need to produce a child, but her need to create a life that reflects her true expressive self. This twelve-year memoir of profound personal transformation and friendships is a true page-turner. Again and again, you will ask yourself "what could possibly happen next?" Born in Los Angeles California, Susan Joyce spent most of her childhood in Tucson, Arizona and returned to LA as a young working woman. Inspired as a child by postcards from her globe-trotting great aunt, Susan left the United States at age 20 to see the world. She planned on being gone for a year, but ended up living her 20s and 30s in Europe and the Middle East. As a Jill of all trades, she worked as a secretary, freelance writer, taught computer classes, wrote songs, and became an accomplished artist while writing her first children's book, "Peel, the Extraordinary Elephant." 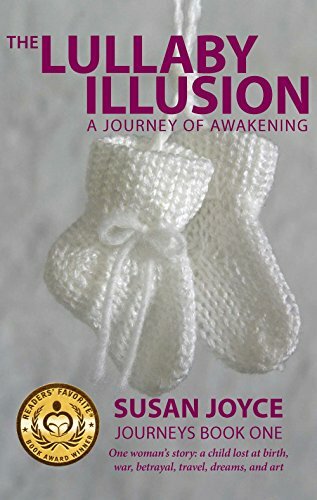 An award winning author and editor of children's books, Susan's first adult book in her memoir series, "The Lullaby Illusion--A Journey of Awakening" is a travelogue of the politics of Europe, the United States, and Israel during a twelve year 'roller-coaster' period of her life and an adventure of survival through friends and sheer determination. • Readers' Favorite 5-Stars and the 2014 GOLD Medal Winner, Non-Fiction--Travel in the 2014 Readers' Favorite International Book Awards. Her second memoir, about transitting the Indian Ocean in monsoon season, is enttiled "Good Morning Diego Garcia" and will be published in February 2016. In the early morning hours of the third day, the battle raged on. Turkish jets flew low passes over the UN area, launching rockets at Greek enclaves across the pass. I cowered in fear every time I heard the initial “pop” sound overhead, followed by a whistle, and the deafening explosion. Wherever that rocket ended, horrific destruction was a certainty. In the middle of the fierce fighting, I hoped and prayed that neither side would drop bombs short of range. A few times shells fell short of the mountain and landed in the corridor. None had hit us. Yet. As the day wore on, several Greek emplacements went silent. By afternoon, only one lone position remained. “They’re brave to stay,” I said. “Or stupid,” someone else replied. Silently, I blessed them nonetheless. Thoughts matter. We listened to an announcement from BFBS. A CONVOY FOR CIVILIANS WILL RUN FROM FAMAGUSTA TO THE BRITISH BASE. ARRANGEMENTS ARE BEING MADE FOR CIVILIANS IN THE NICOSIA AREA. “No mention of evacuation plans for civilians in Kyrenia,” I remarked. “Do they even know we’re here?” Ronit asked. Ronit left to go to the bathroom. When an hour passed and she hadn’t returned, I decided to look for her, and fill water bottles on the way back. A British tourist stopped me and asked if I’d heard about the UN jeep abducted by the Greek army. Apparently Greek soldiers had kidnapped UN soldiers and taken their uniforms. Dressed as UN soldiers, they were traveling freely through Turkish areas, killing Turks. “UN soldiers can’t carry loaded weapons and can’t load weapons until they’ve been fired on,” the man added. “When will the nightmare end?” I asked him, before moving on to continue my search for Ronit. In the blink of an eye, my world had been turned upside down. And now, turned upside down again. I continued along the dirt road, across the parking area, and climbed the hill to the toilets. No sign of Ronit anywhere. I filled bottles with water and quenched my thirst by drinking a bottle while standing near the tap. Thirst quenched, I walked back down the hill. Almost to the parking lot, sudden gunfire interrupted my stroll. I scrambled for cover between a row of parked cars. Ahead, I noticed a man also hiding between parked cars. I watched him crawl forward in the direction of the dirt road. As he neared it, an explosion shook the ground. He waited until the dust cleared, then dashed across the road, away from the parking lot, and disappeared downhill. I heard a loud thunk-thud sound and looked up. Less than a meter from my face, I saw a bullet lodged in in the metal just above the car window. A sudden realization made me sick to my stomach. If one car gets hit and catches fire, the entire parking lot of cars will go up in flames. They are parked so close together. An inferno. I shuddered at the thought. I had to get far away from the packed parking lot. Clutching water bottles, I stooped low and moved toward the road. As soon as the shooting subsided, I raced north across the parking lot, over the dirt road, and scrambled downhill. I sat down under a tree, waiting for my racing heart to slow down. I dove into the trench. Bullets whizzed overhead. Targeting the very spot I had fled a split second before. “Whew,” I sighed, landing. If I hadn’t run when I did, I’d be dead. “Are you okay?” Josh asked. “Good reflexes,” Josh said, handing me two empty bottles. I waited for quiet, climbed out of the trench and walked back to my site.